Over the last three decades, while every other aspect of CryoEM has seen the advantages of major new developments, the method for vitrifying specimens onto EM grids had remained essentially unchanged. An aliquot of ∼3μL of sample is applied onto a holey substrate supported by a metal mesh, followed by blotting most of the sample away so as to produce a thin film, and then rapid plunge freezing into liquid ethane. Many trials are often required to obtain suitably thin (~100’s nm or less) vitrified layers amenable to cryoEM imaging, which results in a waste of precious sample as well as considerable resources in terms of microscope and personnel time. Although commercially available instruments provide some modest levels of automation to control the vitrification process, obtaining satisfactory vitrified specimens remains a bottleneck in the CryoEM pipeline. 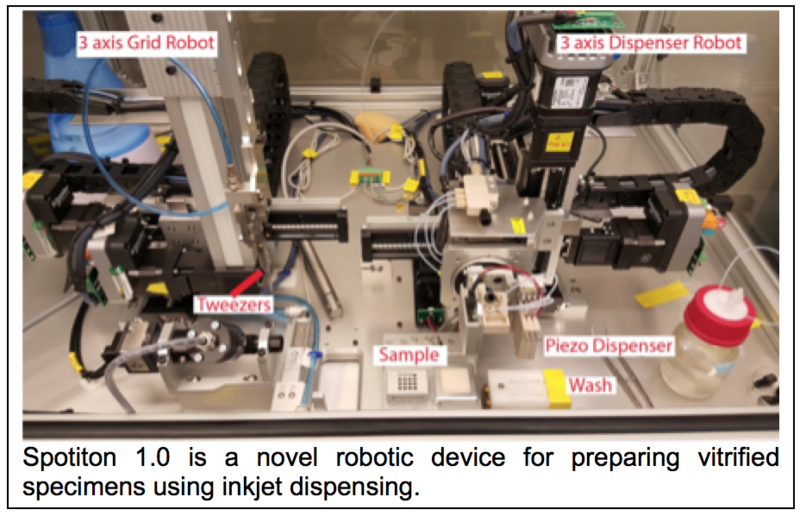 Our goal for this TRD was to demonstrate the possibility of a completely novel device for EM specimen vitrification based on small volume (picoliter to nanoliter) dispensing using inkjet technol ogy. Over the last 4 years we have designed 3 prototypes of this device, which we refer to as Spotiton. The first, Spotition 0.5, was a home built instrument that we used to explore the feasibility of the approach and determine critical design parameters (Jain, Sheehan, 2012). The design incorporated optical cameras (100 Hz frame rate) that record movies to facilitate analyzing picoliter to nanoliter droplet profiles in-flight ( and understanding the spreading dynamics on the grid. We also undertook a variety of structural and functional studies to address concerns that the electro-physical mechanism of piezo-electric dispensing would disrupt protein structure (Jain, Sheehan, 2012). Following on this prototype we developed Spotiton 0.75, working with Engineering Arts, a company with expertise relating to customized piezo-based dispensing, drive electronics and automation. Spotiton 0.75 improved on the basic prototype in a number of ways including: the addition of 3 dispensing heads; the addition of a controlled humidity and temperature chamber; and the addition of a better level of automation. We used this device to try to understand how to optimize ice thickness and particle distribution across a la rge variety of substrates and a variety of preparation conditions. Extensive use of this prototype then led to the design and development of Spotiton 1.0, which was installed in mid-2015. Spotiton 1.0 improvements included: ease of use, addressed by introducing a single graphical user interface that controls all of the functions of the new robot; better motion control, achieved by incorporating additional motion systems for the tweezers and improved actuators for the piezo dispensers; improved motion robotics to attain more control, accuracy and precision; major improvements to the software to automate most steps; an improved design of the cryogen bowl, and automated transfer of the grid form the ethane to a grid storage box. Over the past 4 years we experimented with numerous substrates and methods in an effort to use Spotiton to achieve reliable and reproducible thin ice without the need for externally applied blotting paper. A wide variety of substrates and geometries as well as surface treatments were investigated but none proved satisfactory. 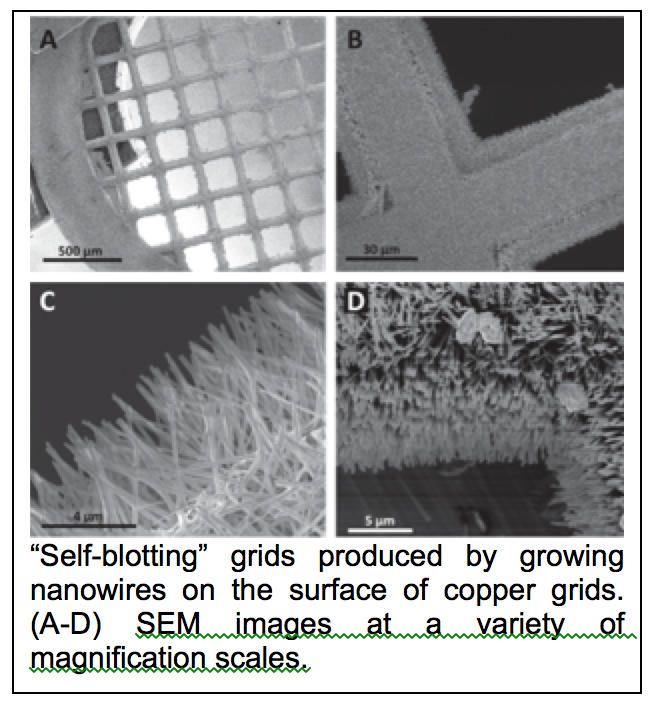 T hen, about a year ago we discovered a method for growing nanowires on a copper surface (Zhang, Zhang, 2013) that we have adapted to create a “self-blotting” grid (figure 1.4). A simple chemical treatment can be used to grow nanowires of consistent length of ~3-5μm and 0.25μm in diameter. 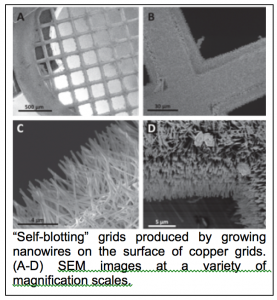 The nanowires are grown by floating the copper grids on top of a 10μL drop of the chemical solution and the density and the number of the nanowires are controlled by the length of time the copper is exposed to the chemical treatment. We use composite copper/palladium grids to produce a mesh with nanowires on the copper side while the non-reactive palladium remains smooth to facilitate adhesion to a holey carbon substrate. The nanowires can be successfully grown on a variety of different sized mesh grids but 150 mesh currently provides the best geometric match to the Spotiton 1.0 robot. We have tested Spotiton and the nanowire girds on a variety of samples including 70S ribosomes, hemagglutinin (HA) and apoferritin (figure 1.5; bottom right insets show area of grid square where images were obtained and top left insets show portion of image at larger scale). We have repeated all of these experiments several times and shown that it is possible toachieve consistent and predictable results. Overall the grids produced using this new approach result in a layer of good quality vitrified ice of consistent thickness that is evenly spread over the entire grid square. Individual particles within the holes are also fairly evenly and well distributed. As a result, within a single square of a nanowire grid we have several 1000 individual holes covered in vitreous ice of appropriate thickness and particle distribution. Thus an entire dataset can be obtained from a single grid square from a nanowire grid prepared using Spotiton. Jain, T., Sheehan, P., Crum, J., Carragher, B., and Potter, C.S. (2012). Spotiton: a prototype for an integrated inkjet dispense and vitrification system for cryo-TEM. J Struct Biol 179, 68-75. Pubmed. Zhang, F., Zhang, W.B., Shi, Z., Wang, D., Jin, J., and Jiang, L. (2013). Nanowire-Haired Inorganic Membranes with Superhydrophilicity and Underwater Ultralow Adhesive Superoleophobicity for High-Efficiency Oil/Water Separation. Advanced Materials 25, 4192-4198. Pubmed.